This is the pressing of the sleeve artwork with the correct spelling of the artist name and track titles. 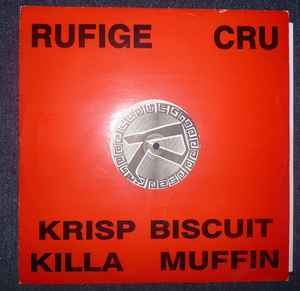 There is also the misprint version that spelt the main artist as Ruffige Creu and the track titles spelt as: 'Kris Biscuit' and 'Killer Muffin'. The runout grooves read ‘PR-E’ and ‘JA’.